The view north over False Creek from the Vancouver 2010 Olympic Games Athletes Village. City council unanimously endorsed a plan Tuesday night to create a high-density, mixed-use neighbourhood of about 7,000 people around BC Place Stadium and GM Place on the final undeveloped section of the former Expo lands. The controversial concept includes a new civic plaza plus four million square feet of residential space and 1.8 million square feet of office space. What it doesn’t include is the 2.75 acres of park space per 1,000 people that city council holds as a goal. Coun. Suzanne Anton, who unsuccessfully pushed for changes to the plan to include more park space, said she thinks residents will be shortchanged if the developers don’t provide the expected amenities. “I am an advocate of density,” Anton told The Vancouver Sun. “I think it makes a city more interesting, I think it makes it more livable, and most important, I think it’s better for the environment. If the park ratio of 2.75 acres per 1,000 residents was to be met, it would require an additional 19.8 acres of park land for the 7,200 new residents, according to the staff report. As proposed, densities in northeast False Creek will be among the highest in the downtown peninsula, the report said, noting the high-density push is being driven by the city’s goal of becoming the greenest city in the world by 2020. Coun. Geoff Meggs stressed that the plan will take years to be implemented. PavCo, the provincial arm that manages BC Place, wants to cover much of the cost of the stadium’s new retractable roof through the development around the stadium. “What the community is getting for that new density is the roof,” Meggs said. Patsy McMillan, who lives in Citygate near Science World, said she isn’t happy with city council’s decision. “Everybody’s very disappointed. There was nothing in [the motion] for the larger park or the community,” McMillan said. 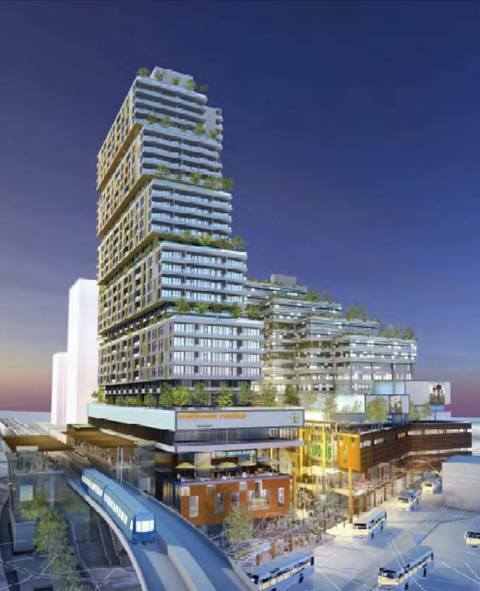 “We’re not in favour of that much density without the appropriate amenities and park space,” McMillan said. The city’s plan for the new northeast False Creek isn’t exclusively for young singles or childless couples — it calls for housing suitable for families with children, including units sheltered from event traffic and noise. The report also calls for child care centres. A new elementary school in International Village was also discussed by council, but there are no plans now for a new secondary school in the downtown core. There is no other comparable development in any North American city. Some cities have baseball parks or hockey rinks with one or two residential towers located nearby or integrated into the sports venue. No other city has multiple stadiums surrounded by a cluster of towers. The strategy calls for building design requirements to reduce the impact of noise from the two stadiums. The city will be reviewing height restrictions and view corridors in January. Buildings in Citygate near the proposed development are between 22 and 28 storeys high. The five owners of property in the area are Concord Pacific, BC PavCo, Canadian Metropolitan Properties, Aquilini Developments and Central Heat Distribution. The report, Northeast False Creek Directions for the Future, is authored by planners Michael Gordon and Paula Huber. In this post to his blog on the Planetizen website for architects and urban planners, Brent Toderian, the City of Vancouver’s Director of Planning, reflects on his meeting last Saturday with Prince Charles, Hank Dittmar who heads The Prince’s Foundation for the Urban Environment, and a number of noted urbanists and sustainability experts.